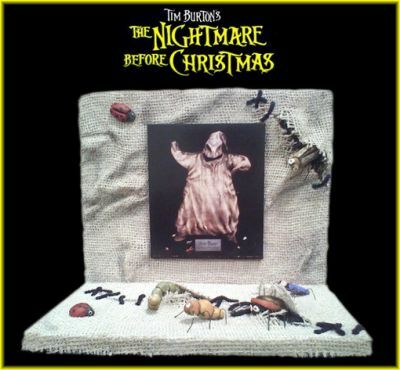 This is Oogie Boogie's screen used bugs from the Tim Burton animated classic "The Nightmare Before Christmas". This themed display containing seven screen used Oogie Boogie bugs was made to appear as the body of Oogie Boogie is being unstitched and the bugs are slowly beginning to escape. These bugs were used in the film during the scene when Jack Skellington hooks Oogie Boogie causing his fabric like skin to start tearing at the stitches showing his body being made up entirely of bugs as they begin to escape.